We’re always excited when a product is impossible to keep in stock. So many of our bedding lines have their own following. For example, we’re one of the only stores in the area promoting washable wool as a superior material to down; we don’t positively promote memory foam, but rather botanical latex created via our own patented Dunlop cooking process. We’ve noticed people pay attention when a business chooses not to operate like the competition. All of these products took time to build a loyal following. That’s common and what we normally expect when we bring new merchandise into the store. So when we first introduced the Acacia Phillipe line, we were confident in the quality of the product but trusted it would take a while for our customer base to catch on. We were so wrong, and we couldn’t be happier. We can’t seem to keep enough in stock to meet demand. What’s the appeal of this line? I mean, have you seen the photos? 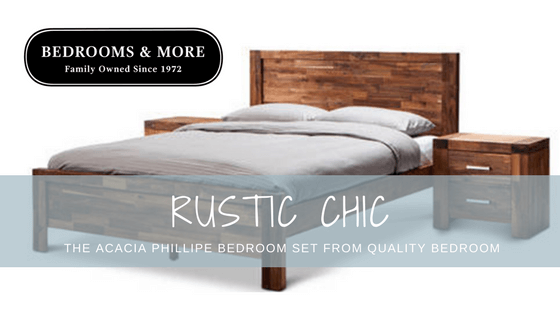 Rustic Chic, also known as Farmhouse Chic, is very fashionable right now. The Acacia Phillipe offers a genuine rustic feel with beautifully-stained finishes. Every piece is constructed from 100% acacia wood, a class of trees and shrubs known for their sustainability and gorgeous color. All those positives with a price tag to match, because a full bedroom set with a queen-size bed frame comes in at under $1,000 before tax. We know what you’re thinking, and no, you’re not dreaming. This is real. Java Rustic or Ash Grey? Our Acacia Phillipe Bedroom Set comes in either the Java Rustic or Ash Grey finish. Shop online or visit in-store to decide which works best for your home’s aesthetic. But don’t wait too long. Our current supplies are limited.